On a swim to the Dutchman Rocks and back, it is much safer to swim in a direct line from the beach to the rock (parallel to shore) or towards Fennell’s Bay and on to the rock (weather permitting), than swimming out to sea and then heading back in to the rock. 1. Out past the line of the Rock, pleasure craft and smaller commercial vessels regularly use this space and you probably will not be visible to them. They will not expect to encounter swimmers that far out and may not be watching. There is no good reason for swimmers to be 300mts to 500mts offshore in Myrtleville. 2. The likelihood of not being able to deal with the unexpected – i.e. currents which can be strong, cramp, cold – is much more likely at these distances offshore. Last week the skipper of a small local trawler had a near miss with two swimmers approx 350 mts offshore in Myrtleville. He did not see them until very late and was lucky to do so. He got an unpleasant fright, but it could have been a very serious accident. 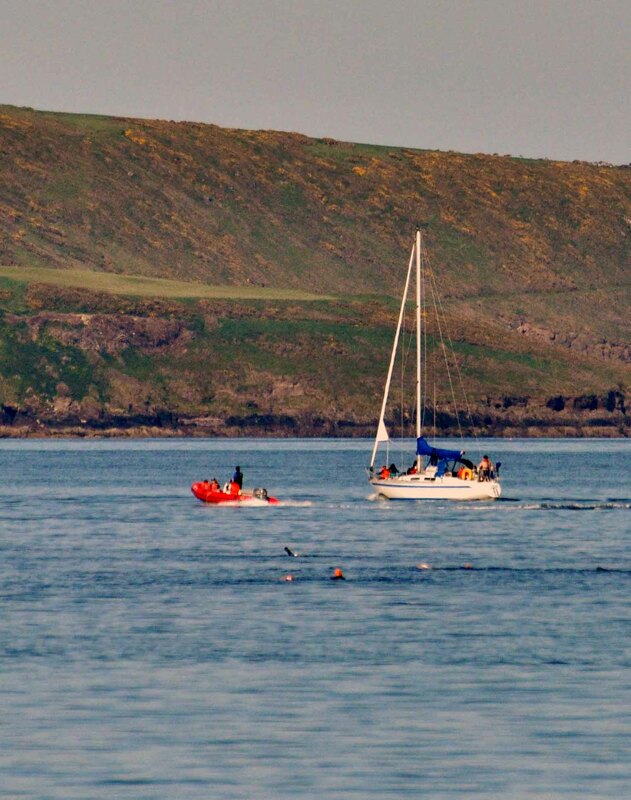 Swimmers & Boats at Myrtleville – stay closer to shore for safety. With suitable weather conditions, Myrtleville provides great swimming options, ranging from a paddle to 8km swims. Just remember that you are sharing the open water with a variety of boats and they may not be watching for you – especially if you are too far offshore and outside the line between the Dutchman and Bunny Connellan. Know your limits – stay safe, swim safe. This entry was posted in Information and tagged Myrtleville swimming, Open water swimming - Cork, Open water swimming - Cork - Ireland, Sea swimming - Cork, Sea Swimming - Cork - Ireland, Swim Safe by myrtlevilleswimmers. Bookmark the permalink. I started open water swimming last April with a few friends. We are really enjoying it. We did our first swim to the Dutchman this morning. It was fantastic. The safety advice from Bernard, Cpt Tom and Damien was very helpful thank you. Great to hear, Michael. Very well done on your Dutchman swim.